Alternate Beginners Cave is an Eamon adventure written by Rick Volberding. An alternative to Donald Brown's original introductory adventure which gives a little more colour and a different experience for starting characters. Head east into the cave, stop to read the damaged sign and admire the vulture if you want, then head further east and defeat the grey bird. Head east to the four way intersection then go north to find a box marked with unknown writing. Open the box and take the magic dagger and parchment (read the parchment for hints to one of the game's specials), then continue north into the jewel-lined precious room to find a glass case containing a diamond dragon statue. Opening the glass case will cause the dragon to come to life and attack you, but it isn't a tough battle; once it's defeated, you can take the statue as a valuable treasure item. Return to the intersection, then head south and follow the passage east to Rufus' luxurious room, where the indolent Rufus may become a companion. Kill or befriend him, take the rare fruit, and return to the intersection and continue east. Continue east to the cylindrical shaft (which unfortunately you can't climb). Through the south door is treasure in the form of a lily growing in a small cubbyhole; to the north is a balcony containing one of this adventure's special encounters, a difficult battle with a Mudlobber wasp along with an earthenware jar and a brown vial. If you read the label on the jar, you'll find it's a waspicide – using it on the wasp will win an instant victory. This is also a valuable treasure, so you might want to try killing the wasp the old-fashioned way, perhaps by using the vial and readying the dagger as the parchment instructed to temporarily increase your hardiness. Drinking the jar also has an amusing affect as well, though it obviously wastes the jar. Head east to the T-intersection. To the north waits a troll whom you can either kill, befriend, or skip. Continue east, then turn south. In the watery passage, open the grate in the floor to find a sapphire. Continue south, then head east into a passage with a sloping floor and a suspicious shimmering wall; examine the wall to find a secret passage. Head through into the next diamond-shaped room and defeat the odd creature described as a hill climber. Take its body since it's a valuable creature and serves as a treasure item. At the beach, there is nothing north, but to the south is a possible ally, the green-clad prince and a cage full of magpies which count as another treasure. Continue east across the isthmus to the island, where you'll end up in the courtyard of a fortress where an intimidating warrior known as the Killmaster is holding a ballerina hostage. Defeat the Killmaster (a tough battle but easier with allies) and take his whip. Nina the lost ballerina will follow you, though it's likely you'll find the silver bars too heavy to carry. Don't worry, you've plenty of treasure. Unfortunately, since the door to the fortress is welded shut there's no way to continue, so you'll have to return west to the T-intersection and ascend the stairs. Get the two jewels, then continue west into the round passage and follow it south into the crawl way. Continue west into a strange, shifting passage, then onward through the western end and you'll find yourself back at the cavern where you fought the bird. That's everything, so just go west back to the Main Hall. Like Cynthia from the original Beginners Cave, Nina gives you an amount of gold based on your charisma by selling her ballet slippers to Sam Slicker. She also thanks you with a kiss. When converting the adventure to Eamon Deluxe format, Frank Black did not alter any of the content, however he did insert some extra object descriptions, particularly for dead boddies. The adventure gained an overall rating of 5.6 from the National Eamon User's Club, and Tom Zuchowski awarded it a 5. Zuchowski described it as an adequate adventure for young Eamonauts and first-time players, and a good job considering the target audience. Luke Hewitt in his review of the adventure in Eamon Deluxe awarded the Alternate Beginners Cave a 6 and praised its style, though he was disappointed at the fact that the adventure finished in a fortress at a door welded shut. 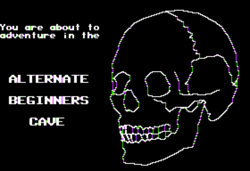 The Alternate Beginners Cave has no intro text except for a title page bearing a skull, and neither does William Misslefire appear to guard the way against adventurers being too strong to enter. It is also the only beginner adventure not to mention the Warlord, though there is a "beginners cave" sign at the entrance and the cave is still described by later authors to be east of the Main Hall. Since a battered warning notice can be seen in the second room, it is possible that the cave is an area which used to be used for guild training but isn't any longer due to excessive danger and a high mortality rate among adventurers. This page was last edited on 23 April 2019, at 07:30.